Manchester City win 4-3 on penalties. Raheem Sterling scored the winning penalty as Manchester City beat Chelsea to retain the Carabao Cup at Wembley. After a goalless 120 minutes, City eventually prevailed 4-3 on spot-kicks to win their sixth League Cup title, the second-most of any club behind Liverpool (8). 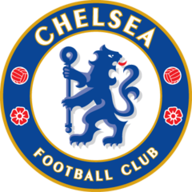 Despite the lack of goals the game was not without its drama, and there will be discussion for some while to come over Kepa Arrizabalaga's refusal to be substituted for Willy Caballero shortly before the shootout. 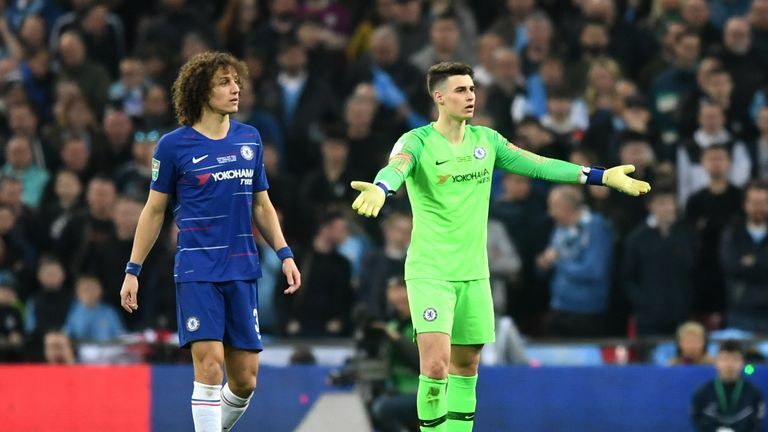 There were incredible scenes at Wembley as Chelsea 'keeper Kepa Arrizabalaga refused to be substituted by Maurizio Sarri in extra time, causing a huge row with his manager! Kepa saved one penalty from Leroy Sane, but City converted their other four and Jorginho and David Luiz both missed to leave Maurizio Sarri still without a trophy in his managerial career and Pep Guardiola's side one trophy down on the potential journey to a quadruple. 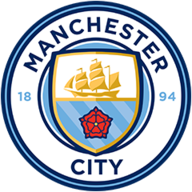 When these two sides met just a fortnight ago at the Etihad Stadium, Manchester City were four up after just 25 minutes on their way to a 6-0 Premier League win, but this was a far tighter affair. The first real sight of goal took 22 minutes to come around when Bernardo Silva floated a lovely ball into the path of Sergio Aguero, who took a smart touch to open up some space but then fired over. Aguero then had the ball in the back of the net after 54 minutes after turning smartly in the box, but it was ruled out for offside. Replays showed the decision was far closer than it looked in real time, with the striker appearing almost level with Antonio Rudiger, but VAR backed the linesman's initial decision. Chelsea came agonisingly close to the opener after 66 minutes as Eden Hazard finally found some space to run in behind. He glided past Vincent Kompany like he was not there then pulled a fine ball back to N'Golo Kante, but he blazed over from 10 yards. Five minutes later they went close again as Willian picked out Ross Barkley, but he curled one just over the bar. Maurizio Sarri made five changes from their win over Malmo on Thursday night in the Europa League. Gonzalo Higuain started on the bench while Marcos Alonso wasn't in the matchday squad. Kepa was fit enough to return in goal. For Man City there was just one change from their midweek win over Schalke in the Champions League as Oleksandr Zinchenko came in for Ilkay Gundogan. City continued to do most of the pressing in extra-time and a moment of quality from Sterling nearly helped them break through. He darted inside from the right and pulled the ball back for Aguero, but Cesar Azpilicueta did just enough to deny him the opportunity to poke home from inside the six-yard box. City could have won it mere minutes before penalties as well as an untimely slip by Rudiger allowed Sane in. He fed Aguero but his shot from the edge of the area was well held by Kepa. Kepa appeared to injure himself in the process, which led to the moment of the final as he refused to be substituted despite his number going up, leaving Sarri apoplectic on the touchline and Cabellero trudging back to his seat. Ederson then saved the first penalty from Jorginho, before Ilkay Gundogan, Azpilicueta, Aguero and Emerson all scored to make it 2-2. Kepa then saved from Sane but Luiz followed up immediately to hit the post for Chelsea. Bernardo slotted for City before Hazard put the pressure on Sterling, but he found the top corner to send one side of Wembley into raptures. It wasn't a vintage City attacking display by any means as they were frustrated throughout 120 minutes by Chelsea, but Bernardo once again highlighted his position as arguably City's most important midfielder with a fantastic display first on the right side of an attacking three and then after dropping into a deeper role. Manchester City have won the League Cup for a sixth time - only Liverpool (eight) have won the trophy more often in the competition's history. The last two League Cup finals to go to penalties have both been won by Manchester City (also 2016 against Liverpool). This was the first League Cup final to end goalless since 2009, when Man Utd and Spurs played out a goalless draw. The last two occasions that Man City have failed to score in a match this season have come against Chelsea (also 0-2 at Stamford Bridge in December). Manchester City have won each of their last six penalty shootouts, with the last five all coming in the League Cup. Callum Hudson-Odoi - aged 18 years and 109 days - became Chelsea's second-youngest player to appear in a League Cup final, after John Boyle (18y 80d) in 1965. 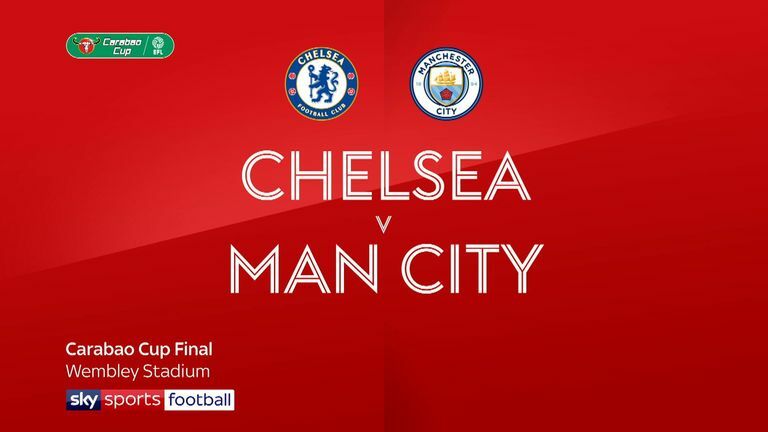 Two of the four finals involving Manchester City's Pep Guardiola as a manager to have gone to penalties have been against Chelsea, with Guardiola winning both (also 2013 Super Cup with Bayern Munich). 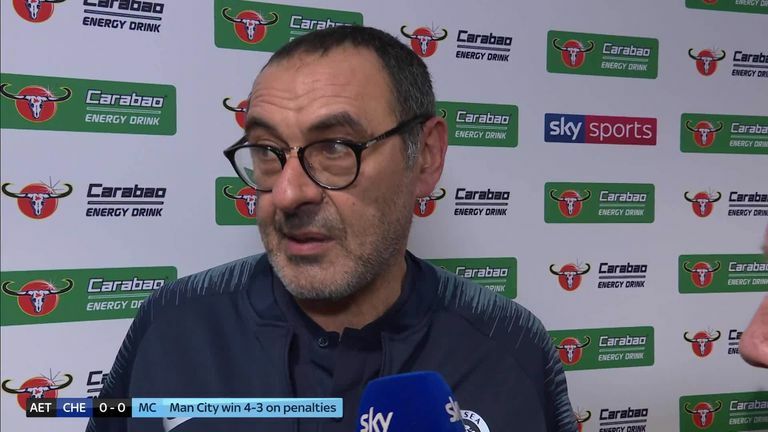 Maurizio Sarri: "You have to speak about football, we played a very good match - there was a misunderstanding because I thought the goalkeeper had cramp so was unable to carry on for penalties, but that wasn't the case. Chelsea boss Maurizio Sarri says what happened with goalkeeper Kepa Arrizabalaga was a big misunderstanding. "I needed only to return to be quiet - as I said, the 'keeper understood I asked for the change for the injury, but he didn't need to come off. "I realised only afterwards when the doctor came back to the bench - I only need to talk to him afterwards to clarify the situation, nothing else." Pep Guardiola: "It was a tight game and we knew it would be because it was a final. I was impressed with the way Chelsea defended, they were well organised and one of the toughest teams I've faced in my career. 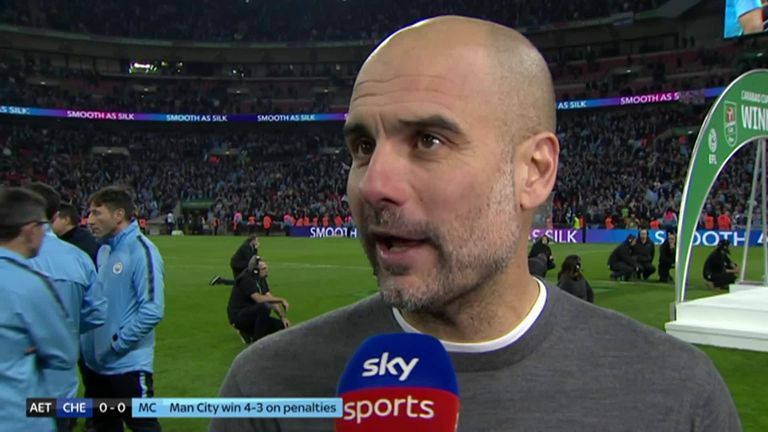 Pep Guardiola described Chelsea's performance as 'incredible' as they took his side to penalties in the Carabao Cup final. "We knew they have pride and they would react [from the 6-0 defeat]. This game was more similar to the game at Stamford Bridge, which we lost. It was tough. "I thought we played well for 70 minutes but then we suffered because we were tired. We had a few injuries as well which will demand a lot of us and now we could suffer [in other competitions], but the title will help our mood going forward. I'm tired but I'm happy." Both sides have 8pm kick-offs at home in the Premier League on Wednesday night. Chelsea have a huge game against Tottenham while Man City host West Ham.